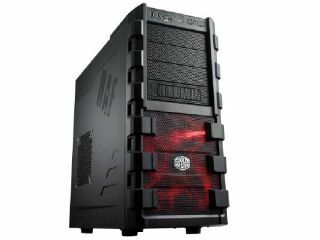 Coolermaster has announced the HAF 912 Plus case - describing it as an affordable yet 'no compromise chassis' for gamers. Coolermaster's HAF range has been popular among gaming PC builders, and the latest is aimed at finding the right balance between features, cost, size, cooling and space. "No matter if you are looking for an affordable, no compromise gaming chassis or for a case with all the bells and whistles and great support for water cooling accessories: the HAF 912 is the ultimate model for you," states Coolermaster's release. That space includes room for four 5.25-inch drives, six 3.5-inch internal drives and two 2.5-inch drives in its standard configuration but it can accept 3.5-inch drives and you also get a 3.5 to 2.5-inch adapter that accepts two more 2.5-inch drives. The HAF 912 Plus comes with a front mounted 200mm fan with a rear 120mm fan and space for a top mounted 200mm and an optional side mounted 120 or 140mm fan. "The HAF 912 Plus was designed to meet the requirements of those that want something out of the ordinary, yet it was built to be affordable, explains Coolermaster. "This doesn't mean that Coolermaster has compromised on quality, as the HAF is all about quality making this a fantastic choice in terms of features." The HAF 912 Plus has been given a UK release date of mid-September with a price of around £65.